Do you hear what I hear? 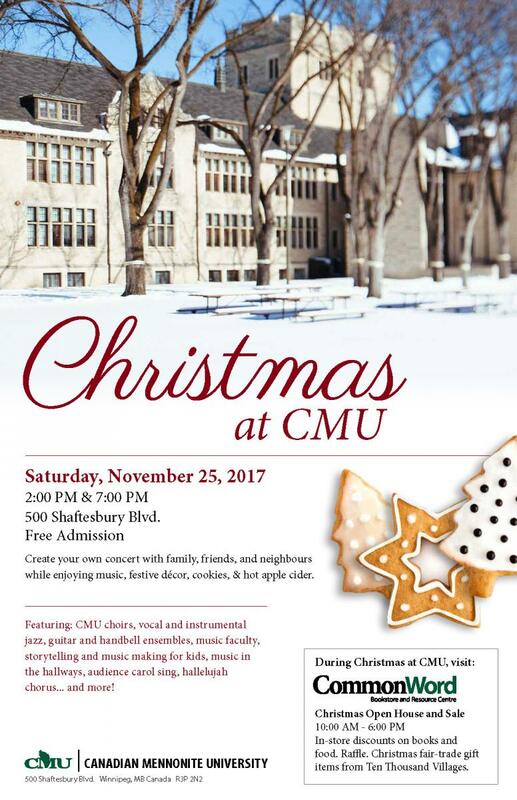 Canadian Mennonite University wants you to join in the festive fun at its annual Christmas at CMU concert. The event takes place on Saturday, November 25 at the university (500 Shaftesbury Blvd.). There are two concerts: one at 2:00 PM and the other at 7:00 PM. Admission for both concerts is free. More than 100 performers are involved in the event, which features CMU choirs; vocal and instrumental jazz; a classical guitar ensemble; and performances by the university’s music faculty. Christmas at CMU is a multi-generational, interactive event that allows family, friends, and neighbours of all ages to mingle in CMU’s beautiful heritage building. Part of the event’s appeal is that people who attend do not have to sit in the same spot for an hour-and-a-half. Music ensembles will be stationed in different parts of the university, allowing attendees to create their own concert by walking around the festively decorated campus—all while enjoying hot apple cider and cookies. Now in its 17th year, this year’s Christmas at CMU event once again features a couple of items on the schedule specifically for children. Children and parents are welcome to make music with Music Therapy students at “Christmas for All Ages!” in CMU’s Faculty & Staff Lounge. Afterward, Bartel will read How the Grinch Stole Christmas. Christmas at CMU will end with an audience carol sing in the Loewen Athletic Centre, an annual tradition that always culminates with everyone singing Handel’s Hallelujah Chorus. The carol sing will be accompanied by the university’s newest ensemble, the CMU Community Concert Band. Since it was first held in 2001, Christmas at CMU has become an important event on the university’s calendar. Alumni and friends from across Canada travel to Winnipeg to attend. 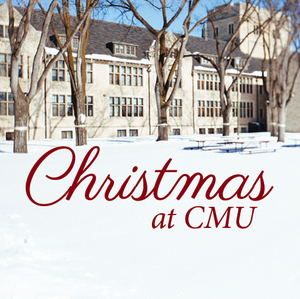 For the complete Christmas at CMU schedule, please visit cmu.ca/christmas.